Books, books, books: from kids in Idaho to kids in Utila, Honduras! Here are 800+ books ready to be boxed up and shipped to the public school of Utila, Honduras. I have a friend that I haven’t seen in almost 20 years, who is a principal of a school in Idaho. When Jeanne and I heard that the public school in Utila didn’t have a library yet, but was building the shelves, I sent an email to my old friend to see if she and the kids and in her school wanted to help the kids in Utila have books to read. 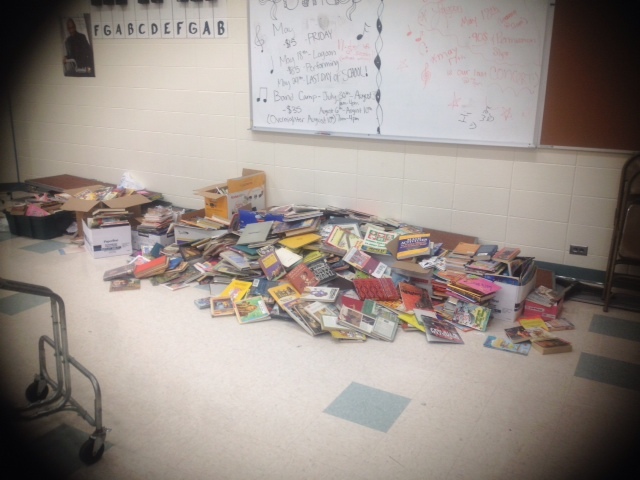 She went to town and in a week of collecting, here is how many books were given! My sister and I are heading to Idaho next week to put all these books in boxes and get them on their way to the Children of Utila! It will be great to see the school library shelves filled with these books. The space already feels like a nice place to hang out and the kids often come there after school. I can’t wait to see them on the shelves too, Jeanne!